Of course, I smiled this morning not because I’m remotely pleased with myself but because it is funny that I was inspired by the Margiela jeans which has somehow filtered down to Bik Bok in a ludicrously round about way with the styling over a suspiciously similar shade of tights. Strangely circular. If you’re influencing people, then that’s a bonus, isn’t it? Harmless fun. And if I didn’t bring the worst oldschool camera ever that day, you’d be able to see that the tights on the pic is exactly the same color as yours.. The bad comments are pretty ridiculous, but for every bad you have about 30 good, so don’t even stress! 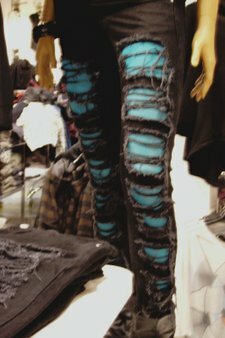 I really like these pants, especially paired over the teal tights, so I can see why they may influence others! Aww. Well when you get negative feedback from randoms, you know you have arrived. I think youre awesome. My whole blog-life started with you and your blog. 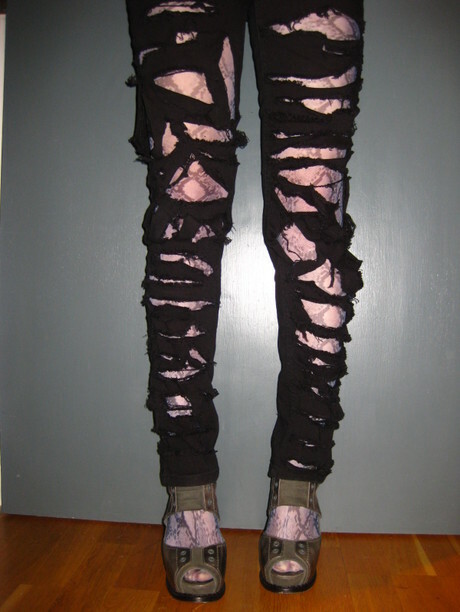 And this whole tights under ripped jeans business is so so awesome. Wish it was cold enough to do here, sadly I live on a tropical island. Hmm. Really like them with the bright pink! I’m so going to try this! The ripped jeans over the silver look AMAZING. Sorry for the all caps, but it was called for. those jeans. oh my god. i missed the original post these were mentioned in, i guess, but wow, they’re fantastic, and since it involves destroying instead of creating, i think it’s a diy i can actually attempt. thanks for the inspiration! Haha, that’s awesome. And you’re so right about it too. Whenever I see those ripped jeans I want to see some color peeking out. those jeans are amazing and how lovely that you have such an imitator… and boo on boo… i’ve always found you to have a pretty eclectic view of fashion and prices. aka I LOVE YOU! This is my first comment I’ve ever posted, but I just want you to know that as a design student I really appreciate everything that you write about. It is really inspiring to see that people truly care about the process and intricacies of design. I don’t have much time to research and see much of what else is happening in the world but you keep me (and so many other designers) in the loop of what is going on. We love you Susie! Keep up the excellent work! I love this look! 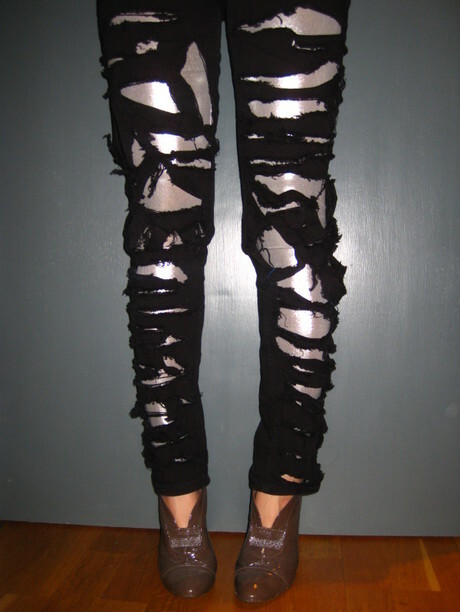 I am totally tempted to take a pair of my jeans and do my own little diy project. Let me tell you I am not the best with diy but this little need to try is being lit in me every time I see these. ah yes, bik bok. i saw many of those stores when i was in stockholm but seems they have evolved a bit (like copying bloggers!) since i was there earlier this year (was mostly the most basic of basics then). i am going to try this with some cheap mondays, and i won’t pretend i didn’t see them here first! i think i’ll go rip some jeans right now and wear some leggings under them tomorrow. I’m so going to copy that look! girl you are amazing! and about boo… I wonder if she get paid to write stupid comments on your blog???? I like the jeans with the pink. Heya thanks guys….I should just get used to is…other bloggers get the negative comment far worse than I do….I just hate actual intelligent ones that I needlessly feel like I have to defend…. I tore up some jeans recently, bc. I was inspired by your original post on the topic. Plus I have no money to buy new clothes, so I decided to breathe new life into old ones. I have yet to find a good pair of tights to wear underneath, but they will have to be warm enough to face the great Canadian winter! P.S I really enjoy your DIY posts! Thanks susie dear!! you are one inspiration. I just Looooove your blog! Haters just justify that you’re presence is felt in fashion circles… cheer up and do what you ought to! And it’s always funny how some haters chicken out and give fake email addresses! 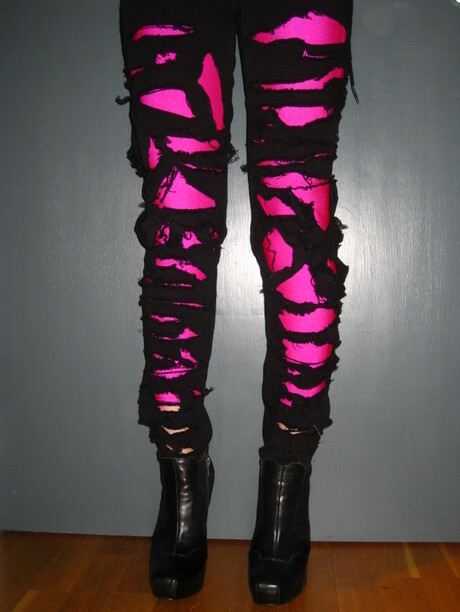 I never really got into the shredded jeans look (it reminds me to much of a certain grunge movement from when I was a kid I think) but THIS I totally like! The turqoise ones are my favourites. And yeah, I laughed too when I read your reply. I wonder if that ‘Boo’ person sews all her clothes with needle and thread – ‘keepin it real’. About a year ago I made this skirt with a super high elasticated waist band, with a big exposed electric blue zip and some odd folding on the front, just a really random design, and someone emailed me a photo from a shop in Australia about 6 months later and they were selling the same skirt! Every detail was exact! It was bizarre and hilarious. I might actually dig it out. I guess they need to find inspiration from some where don’t they? I’ve recently ripped up a pair myself… until now I thought the ripping was the most fun part, but I might try it with different colours underneath as well, white looks quite good too. yours look so much better: a lot less contrived than the “shop bought” ones! Susie the trend setter! Loving the Bik Bok rip off of a Susie original! Your jeans are fantastic, Susie! There are numerous companies out there that employe staff to troll the internet, read blogs, and “steal” style, fashion, design ideas from bloggers. Then those unique, usually DIY, items are mass produced for the public. Urban Outfitters is the biggest culprit. Bik Bok could be a new addition to that list. Ahh the contrast with the leggings underneath is beautifulll. And whenever you get such inappropriate comments, you know that we’ll all have a say in the matter! haha. i’m not even a barbie girl anymore, sadly, but the pink tights/leggings are the best! Woah love it, they look crazy cool!! Plus I would be oh so flattered/horribly offended that a chain store stole my idea without telling me. Sorry about your negative comment! Hehe…as the old, trite saying goes: imitation is the best form of flattery…or something to that effect. Gosh, all three looks are s’marvellous, but I especially love the ripped jeans with silver leggings! Lovely! Regarding the negative comment, you know I think the girl was just being honest. I really don’t think that she was trying to be malicious in any way. Besides there isn’t anything particularily wrong with materialism. You do have a great wardrobe and quite a few of your pieces(though not all) are sadly beyond the financial means of many. It is just a fact not a critisicim. so you inspire designers now, eh? but no. it has to be you. why does it always have to be you? You’re lucky you’ve got absolutely gorgeous legs for this trend … I LOVE IT! especially the the hot pink ones! I was just thinking about your ripped jeans today! Of course putting tights underneath is the quintessential Susiebubble interpretation. Love the look, I’m trying to figure way to try this out without completly imitating you…. yup, I got nothing. ripped jeans is such a new thing isn’t it ? Yup, they run fairly true to size…. but I wear anything between a 37.5-39.5 because my feet change size all the time..
^I got a size US8.5 and they were pretty true to size…. and I’m also between a 38 and 39…. Hi Susie, thanks for replying to me so quickly; I know how busy you are and really appreciate your feedback. I’m planning to order a pair from Nasty Gal Vintage’s e-shop but they (as well as other shops in the US) only have whole sizes. Would you reckon (no responsibility assumed of course) I should get US 9 instead of 8 then? I read what you wrote in a different post about you couldn’t quite walk in them at first although you’ve gotten much better after a long while. That worries me a bit, because you wear really high heels/platforms much more frequently than I do – if even you find these shoes quite difficult to handle, perhaps they are not for me after all.